Happy Friday, all! We’ve enjoyed a very good and very busy week here at CSE. We continued doing various tests this week, which, with our Backers’ help, allowed us to find and fix a nasty proxy crash. We’ve moved on to limited testing of the updated building controls, and once we get Hatchery in a good state, we’ll do more testing on the next scenario map. There’s a lot of fun conversations being had this week as we work through our goals for the start of Beta 1. One of the most fun discussions has included lots of pantomiming to help us improve the look of our combat animations. We’ve created one new ability per class that is meant to be more powerful and a bit flashier in order to help us test our VFX systems. Each of these new abilities are getting unique animations, which has driven much discussion on improving all our animations, and particularly how we use those animations to visually define each of the classes. If you check out this morning’s Morning with Max, you’ll catch a few seconds of Max sneakily turning the camera over to Sandra and myself (Tyler) while we work out how the Forest Stalker’s Overgrowth Shot should look. Personally, I can say this is one of my favorite, and sometimes most difficult, parts of our jobs. Let’s move on to our Top Tenish list for the week, where we cover some of the week’s progress highlights. If you missed today’s livestream with myself and Ben, you can catch that HERE. Testing: We’ve continued testing on Wyrmling this week, trying to track down a proxy crash that caused players to be unable to log back in (also known as “ghosting”) until the server was restarted. We believe we’ve found and fixed this issue, so we’ve moved on today to begin testing the building system, now that Matt has committed his input update. 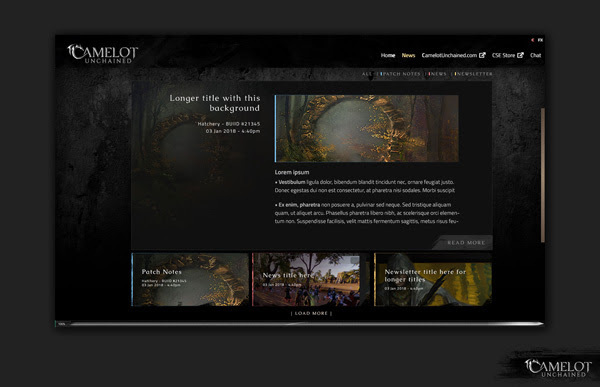 WIP – Design – Crafting: Work continues on building out the design/tech for the Beta 1 launch. 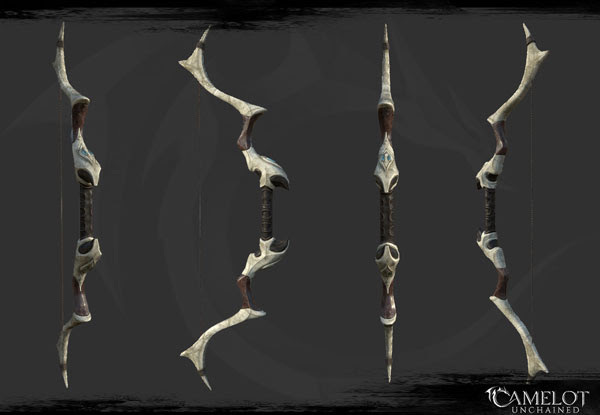 While this will be a subset of the crafting system for the LIVE game, we expect to get a lot of data from players during Beta 1. Just to emphasize an important point: we don’t want to make crafting a grindy, boring mess, either in Beta 1 or in the LIVE game. WIP – Tech/Design – Building Placed Objects: We’ve begun work on the ability for players to place objects from within the building system. This includes an initial design pass from Ben and preliminary work from Christina. Our first pass is intentionally simple, allowing us to classify items that can be placed in the buildings, as well as make doors into working, placeable items. We can’t promise that Rob won’t activate his code to make doors drown. Tech – Improved Projectile Interpolation: Rob added more projectile debugging tools and fixes to projectiles. Now the in-flight and impact visuals better match their actual physics objects. WIP – Tech – Scenario Victory/Defeat/Round Over pop-ups: After dropping item containers into review, AJ has moved on to hooking up the win/loss and results UI elements to the scenarios. WIP – Tech – Terrain Collision Improvements: Matt has been working to improve the way we generate terrain collision, on both the client and the server. The goal here is to fix several long-standing bugs that will improve building on terrain, as well as general player movement and combat. In addition to this, Matt has begun work on a visual debugger to show terrain collision, which will speed up fixes to problems like these in the future. Tech – Editor Improvements: Bull made several quality-of-life improvements to the editor this week, including an improved layout and better selection and deselection of hand-placed assets. Tech – Key Bindings: Key bindings with modifier keys are back, courtesy of George. These were broken after his recent very large and crucial input refactor. You can read about that HERE. WIP – Art – New Ability Animations: Scott finished a polish pass on the Black Knight Void Slash ability, Sandra finished her first pass of the Blackguard Blast Charge animation, and Joe finished his first pass of the Mjölnir Crushing Annihilation animation. These will be tested in-game to improve the timing for gameplay and future animation edits before getting queued for VFX and SFX. WIP – Art – VFX and SFX on Abilities: Mike and dB continue to work with Ben and Rob to hook up assets and fix bugs. Mike finished off the melee, archer, siege, and shared VFX hookups. dB has finished the majority of the re-hookups of the various classes, and is now working on some of the more unique abilities that need tech support from Rob. 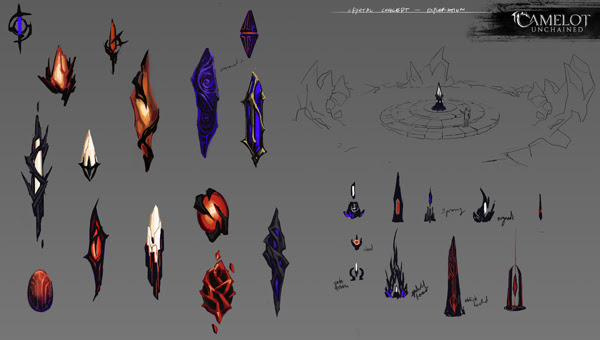 Art – Concept Art: Michelle completed a first pass at concepts for the crystal and pedestal models, which will be used as our flag and receptacle, respectively, in the scenario 2 map. Once approved, these will go to Jon for modeling. WIP – Art – Updated Patcher: As part of our ongoing improvements to the patcher for Beta 1, James has been working on a styling update to the news link to be more in line with our art direction, and has begun styling of the patch notes, which will also be available within the patcher. Art – Scenario 2 Environment Assets: This week, Jon finished the large dragon claw model for one of the capture points, Tyler created five new terrain materials and continued assembling the center terrain mod, while Dionne began work on the mine props for one capture point as well as new rock and plant models. 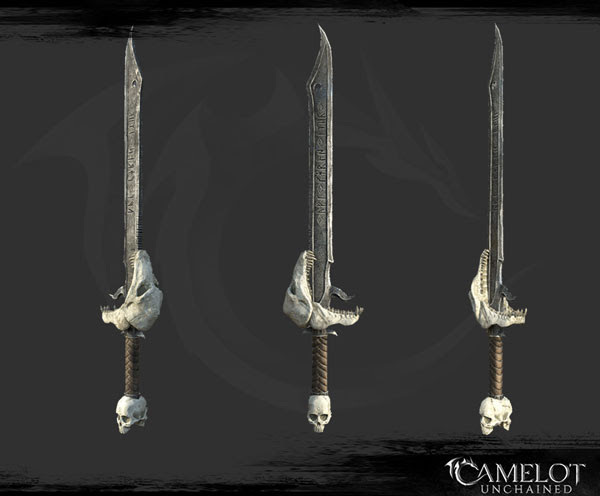 Art – Weapon Contest Winners: This week, in two separate streams, Jon created our weapon design contest winner assets for use in the game. You can find the streams HEREand HERE. Lots of great progress this week! Let’s move into some show-and-tell of new art from our team. 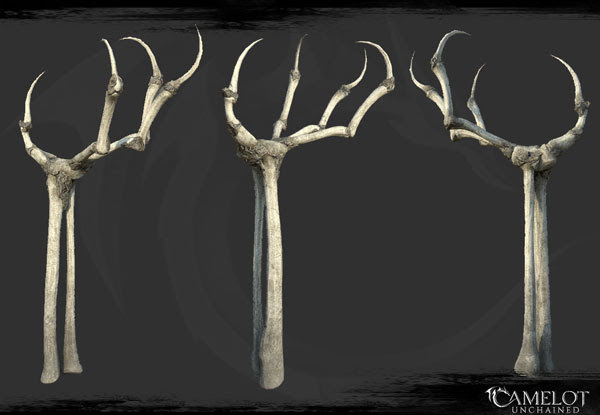 First off, we have the dragon claw, the bottom part of which will rest in the ground with one of the scenario 2 capture points in its palm. This follows up the equally awesome dragon skull we showed last week! Congrats again to the contest winners! Up next, we have some work from James, updating the patcher news styling and integrating patch notes. I (Tyler) have been working on the new scenario map, which of course needs lots of new assets. 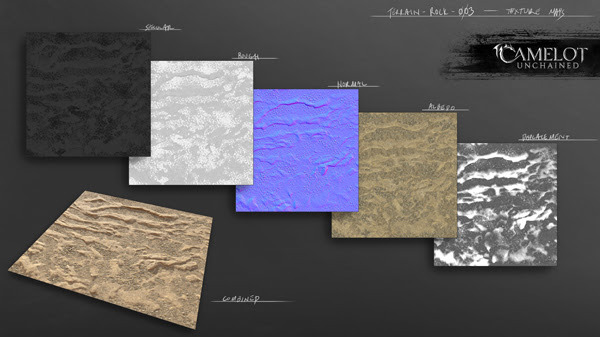 Here’s a couple of terrain materials created this week. 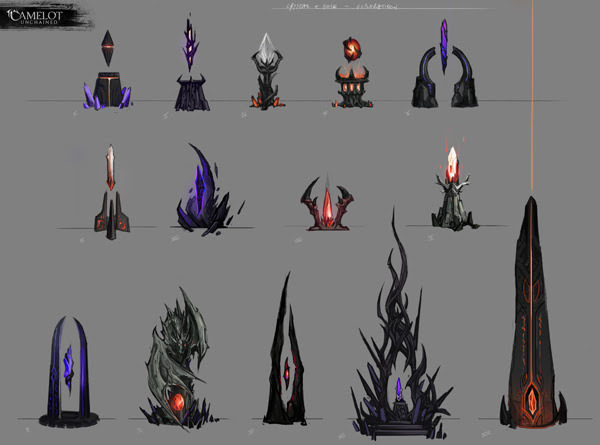 Next, we have some of Michelle’s concept art for the scenario 2 “flag” and receptacle assets. I can’t wait to hand one of these off to Jon to sculpt! That wraps up the art for this week. 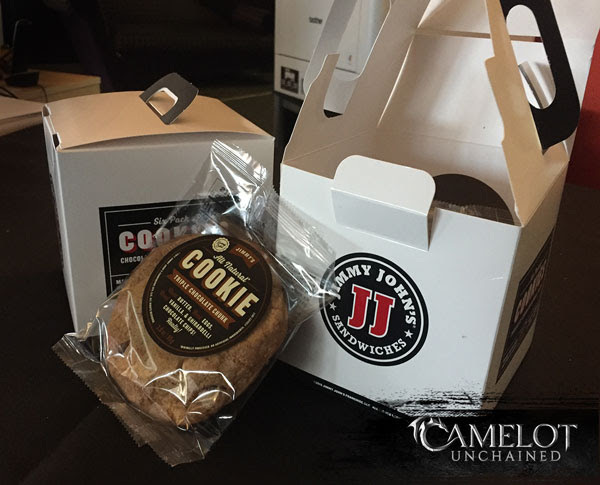 As you’d expect, our artists can become a bit grumpy when they aren’t fed, so it’s a good thing this emergency gift of rations was delivered today! Many thanks to one of our Backers for this extra sweet gift. That wraps another good week for us here at CSE. Despite the occasional snow flurries, things are warming up here in Fairfax as we get closer to a fantastic summer!